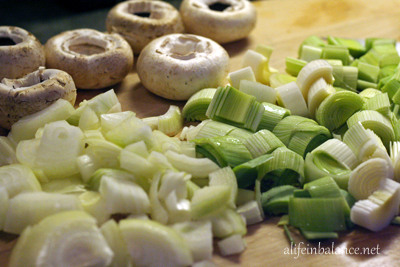 I love the act of chopping vegetables for soup. Soup is so basic yet so varied in its combinations. Big chunks or little? Do I saute the ingredients in butter first, or maybe bacon grease, or just dump them into the stock? Which stock to use? What spices to add? Should I puree at the end or leave the ingredients to co-mingle at will? 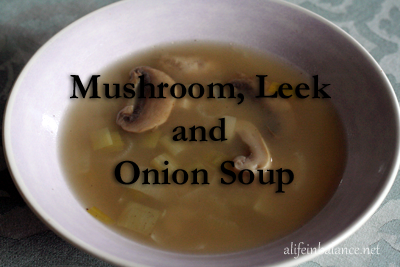 This time, I went with what appealed to me for a Mushroom, Leek and Onion Soup. Especially the thyme. I love soup with thyme in it. I love lots of root vegetables. I like my vegetables a bit on the chunky side, especially the mushrooms. All the better to scoop up one or two veggies in each spoonful. Next time I might throw in a bit of parsnip for sweetness. Who knows what will happen when I open the produce drawer? Sauté mushrooms, onions, and leeks in 4 tablespoons of butter. Add garlic and sauté for another minute. Add chicken stock and water and bring to a boil. Turn heat down and let simmer for about 30 minutes. Salt and pepper to taste. Add in about a half teaspoon to teaspoon of dried thyme to taste. This soup looks delicious! Making it for my spouse and I, I could do thick chunks of veggies. The kids will eat soup with small veggies and enjoy soup that’s been immersion blended, so chunks are a rarity here. That looks so tasty and so easy to throw together! Check back tomorrow when the new link-up is running to see if you were one of the top 3 featured posts!